I have been out of the loop for months and I am really embarrassed by my ghosting behavior. I have been crazy busy writing a new book detailing the pin loom woven animals. I can never remember when I start these projects that, for me at least, writing about weaving is like 900% harder than actually doing the weaving. By the way, please don't be concerned about the lack of specifics on the book at this point, you will hear lots more, more than you likely would ever want to know, about the pin loom animals book in the near future. I also recently returned from Convergence, held in Reno this year. Convergence is the Handweaver's Guild of America (HGA) biannual get-together and if you haven't attended one yet, it is a definite bucket list item for anyone interested in any kind of fiber work. 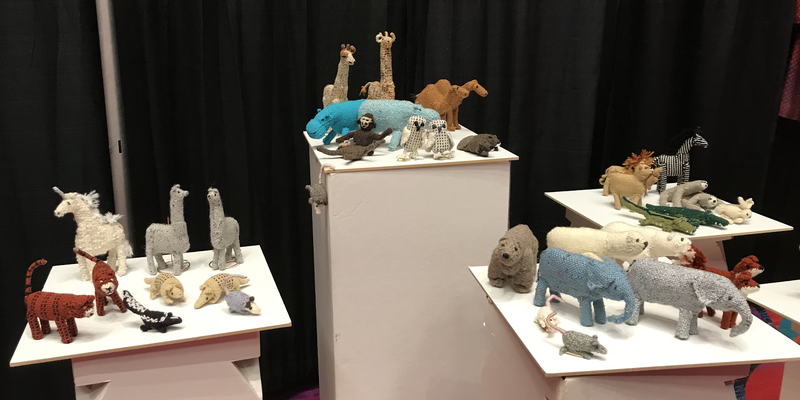 I was able to introduce the pin loom animals to a wider audience at their Leader's Gallery Show and taught two pin loom weaving classes, Introduction to Pin Loom Weaving and Weaving a Spirit Horse, which were both amazing fun. Some of the pin loom animals by Margaret Stump on display at HGA Convergence at Reno, 2018. Speaking of classes, I taught the class, Weaving a Spirit Horse, in by far the fanciest suite that I have ever set foot in. You see the picture to the right? 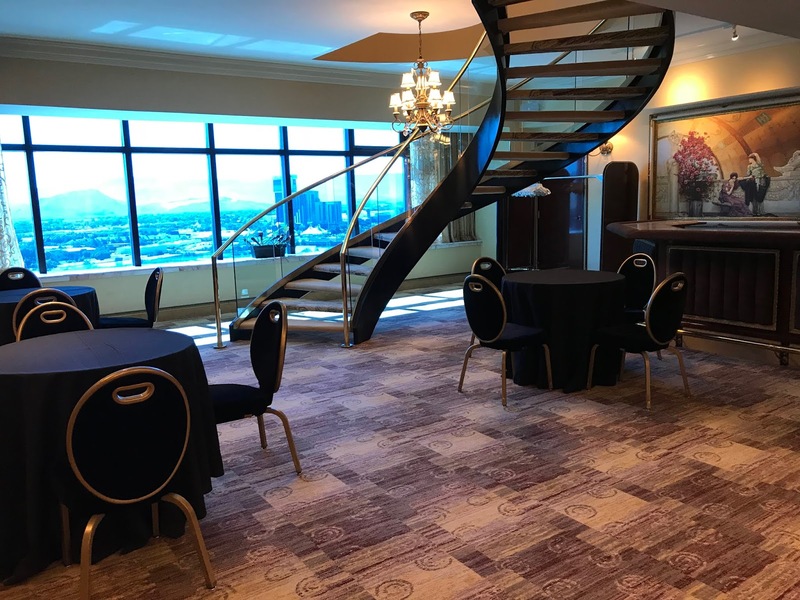 That was just the downstairs reception area...complete with tables, bar and incredible view! 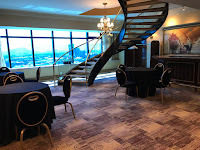 The class was held upstairs in another lovely room with bar (I didn't actually get to use the bar), restrooms and multiple bedrooms, (didn't use those, either). Unfortunately, I was so excited about setting up the classroom for the day long Spirit Horse class that I didn't stop and take pictures. ...As you may have guessed, I am a little, or maybe a lot, I'm not telling, older than the selfie-aware generation. So, you will be hearing about more pin loom weaving info as well as getting updates about enthusiastic pin loom weavers, like Suzanne Eakin, very soon.